City officials have begun seeking bids for the popular food spot around the area's soccer fields - but the longtime vendors are worried that even if they win, they won't be able to stay. According to the bid proposal, all vendors must now use approved food-preparation carts or trucks, which vendors estimate will cost $15,000 to $30,000 per stand. "That's a lot of money we're talking about," said Janet Lainez, whose family has sold El Salvadoran pupusas at the park for almost 18 years. 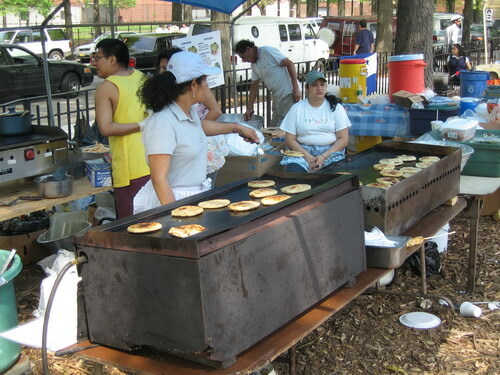 "Very few vendors will have that kind of money," said Lainez, adding that typical food trucks also are too small to handle the four grills she hoped to have this summer for the hundreds of cheese, meat and vegetable pupusas she sells each weekend. "We're not just boiling hotdogs." The mom-and-pop vendors, who have long sold their wares under makeshift tents, also are worried the required changes to bring the ramshackle market up to code will ruin the rustic allure that made the spot popular. "In the best case scenario, we will get the contract, but will the people who have come to love us be willing to welcome all the changes in the same way?" asked Cesar Fuentes, a spokesman for the park's 13 vendors. Do you know anything more about where this stands? I can't find any story on it more recent than March.